For years I have been reading and hearing that I am a bad Florida Marlins fan because I do not attend games regularly. It’s not just me, you understand. 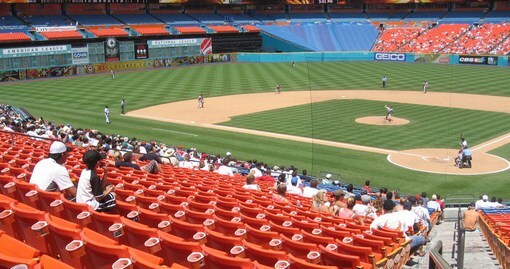 The Marlins enjoy the annual distinction of having the lowest attendance in Major League Baseball. So, Marlins owner, Jeff Loria believes (as previous owners H. Wayne Huizenga and current Boston Red Sox owner John Henry) that if a baseball-only stadium with a retractable roof was constructed it would resolve points 2 and 3 – thereby solving all of the world’s problems. What these out-of-touch rich people don’t realize is that this isn’t Field of Dreams. It’s not about the seats in a stadium and it isn’t the worry of going to a game that will be rained out. It is about having your heart crushed year after year. Yes, I realize that the Marlins have accomplished something very few teams outside of the Bronx have been able to do. They won 2 World Series Championships in less than 10 years. The Marlins made their major league debut as an expansion team in 1993. I attended the first game at the stadium with a bunch of friends. The stadium was packed and our seats were deep in the nosebleeds. But I was at the game and thrilled. No longer was I going to be subjected to attending baseball games during the exhibition season or on my almost annual trips to New York. I attended numerous games in 1993 and in the years that followed. Huizenga and his front office did a great job of mixing in youth and quality higher priced stars and the result was a World Series championship in 1997. For some reason, Huizenga wasn’t happy that the games didn’t sell out immediately and didn’t want to culture a following. He announced during a mid-season series with the New York Yankees that he planned on reducing the salary after the 1997 season whether the Marlins won or not. And dump it he did. The first to go was one of their top hitters, Moises Alou (November 11) followed a week later with trades to closer Robb Nenn and center fielder Devon White. Two days later fan favorite, Mr. Marlin Jeff Conine was gone. Next was pitching ace Kevin Brown. This is how a team wins the World Series and loses over 100 games the next year. If that’s all it was – but noooooooooooooo. To avoid the high salary, the Marlins traded Piazza 8 days later to the Mets for a few unknown players. Zeile hung on with the Marlins until the first annual July fire sale when he was sent to Texas. The salary dump continued – and continued – and continued. Any player, who moved to the top of the salary chart or if they were due a nice increase during the off-season was traded. The trades either happened during the winter months or before the July trading deadline when they could get more young talent courtesy of teams vying for a playoff spot. After the 1998 season, Huizenga sold the team to John Henry but the fire sales and cheapness continued. Each season, we watched a crop of young players play their hearts out nearly always over-achieving. 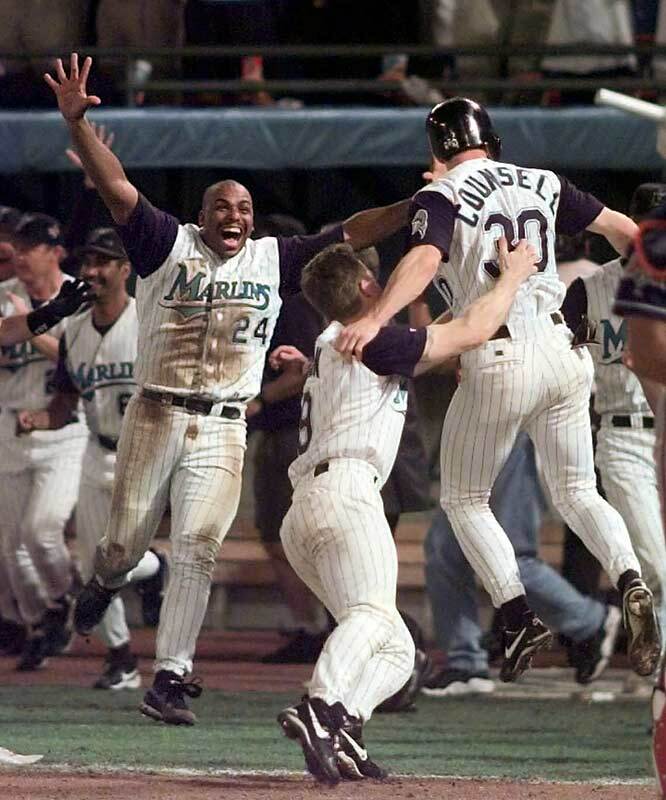 Each season, the fans had hopes that we’d get that player to hang our hats on – the player who’d hang around to reach his prime in a Marlins uniform. Somewhere along the line, John Henry decided to make a pitch for a new baseball only stadium. He said he didn’t have the money to build one himself, like Joe Robbie had done years earlier for the Miami Dolphins. He felt the taxpayers should foot the bill and provide him with the profits. After the 2002 season the big ownership shift occurred. John Henry sold the Marlins and bought the Boston Red Sox AND Fenway Park (but he didn’t have money). Jeffrey Loria sold the Montreal Expos (now Washington Nationals) to Major League Baseball and bought the Florida Marlins. Talk about mixed emotions. I was thrilled that Henry was gone and pissed that he had the money to buy the Red Sox and their stadium but didn’t have the money to try to build a winner and a fan base here. Meanwhile, Loria proved to be a cheap owner in Montreal and I knew he’d pull the same garbage here. Why baseball didn’t try to seek out an owner with some money in their pockets is beyond me. So, 2003 comes and these young kids played well. Miguel Cabrera and Dontrelle Willis came up in May and the Marlins changed managers and the next thing you know the Marlins won the World Series. With a bunch of kids. They beat the high priced New York Yankees. One month after winning the World Series, the Marlins traded power hitting first baseman Derrek Lee and a month later rightfielder Juan Encarnacion was gone. 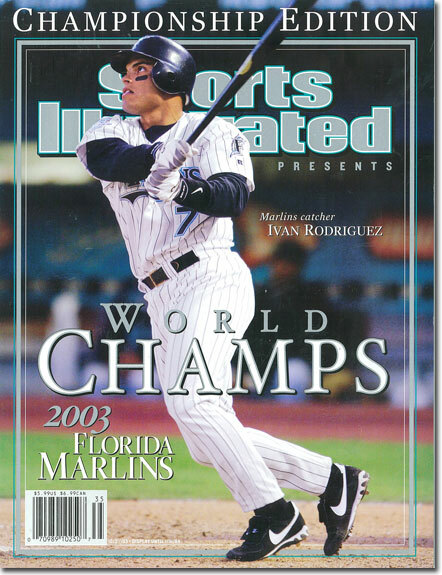 Not to mention the players who left via free agency like catcher Ivan ‘Pudge’ Rodriguez and closer Ugueth Urbina. The Marlins had just won the World Series again and 3 starters were immediately dumped. And you wonder why the fans don’t come flowing out to the stadium. The annual fire sales don’t occur under this regime but what it does is even worse. The Marlins have the lowest payroll in baseball. To make matters worse – the money the Marlins take in from league revenue sharing actually exceeds the team payroll. In other words, any money the team brings in from ticket sales, merchandise, television / radio rights, etc goes right into Loria’s pocket. The City of Miami is using taxpayer money to build a new baseball only stadium at the site that used to be the Orange Bowl. Parking and access to this area is weak. Metro Rail does not have a stop there. The true Marlins fan base is located in Broward and Palm Beach Counties so building the stadium deep into Miami-Dade County makes little sense – especially since a quality offer was made in Hialeah Gardens only minutes from the Broward County line. If you think the fan base is going to attend games there, you’ve got another thing coming. Then Loria will be back to dumping the talent at the regular July fire sale. So let’s put a little perspective on this. For the sake of argument let’s use the New York Yankees. The Yankees won the World Series. Before Thanksgiving, they let Hideki Matsui and Johnny Damon leave via free agency. They trade Derek Jeter, Alex Rodriguez, Jorge Posada and AJ Burnett. 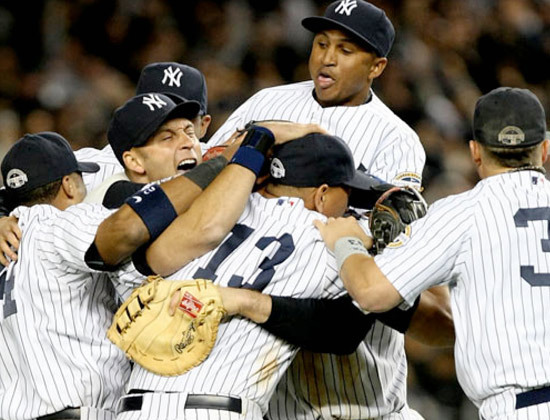 By 2010, CC Sabathia, Andy Pettitte, Mariano Rivera and Mark Teixeira are gone. Everyone traded for an unknown set of minor league prospects. In 2011, with a cast of unknowns, they win 84 games. The fans fall in love with a couple of the better kids. During the off season, they’re both traded. Flash forward 12 seasons. Their payroll is hovering around $50 million while most teams spend between $150 and $200 million. They consistently win 80 to 86 games and their best players last maybe 1 or 2 years tops. They never make a trade to help the team immediately down the stretch. Feel free to throw in a fluke World Series victory in say 2017. After that season, the 4 best players are gone. 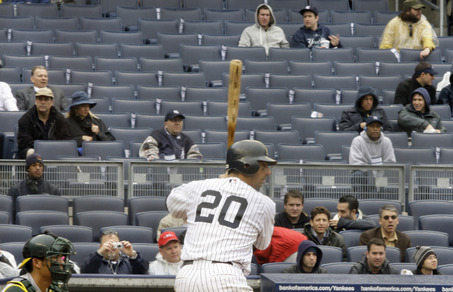 How long before the Yankees fans stop going to the games? It’s obvious that the ‘fictitious’ Steinbrenners don’t care. And I’m ignoring 2 important things here – okay 3. They just opened a brand new state-of-the-art stadium this year with easy access. The Yankees have been around forever and have developed a fan base over generations. If the Yankees were just not good, they’d still get fans. But if they continually dumped the talent, I believe that many fans would take a hike. Especially at the prices they charge. Fans don’t need their teams to win every year. We just need an owner who acts like he cares about the fans and attempts to have a commitment to winning. That is what the Marlins have lacked. This entry was posted in My 2 Buck$ of the Day and tagged Baseball, Florida Marlins, Jeff Loria, New York Yankees, Sports. Bookmark the permalink.